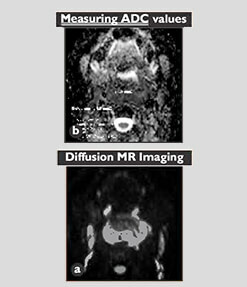 MRI is invaluable in diagnosis and characterization of cranial nerves pathologies. 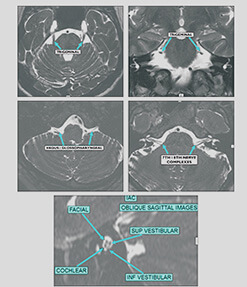 Because of better image quality, higher image resolution, better contrast to noise ratio and thinner slice acquisition 3T MRI outscores lower field strength MRI systems in evaluation of cranial nerve pathologies. 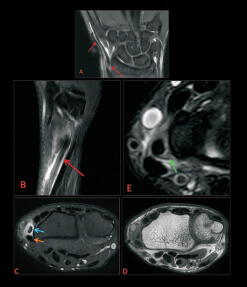 Contrast administration enhances the ability of MRI to detect such abnormalities. Here is pictorious essay of pathologies. We wish you and your Family a Happy DiwaliandtheJoyousFestivalSession. 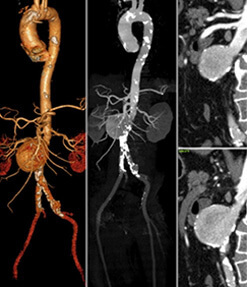 In addition to the routine T1, T2, post contrast T1 spin echo imaging, some special sequences are used. 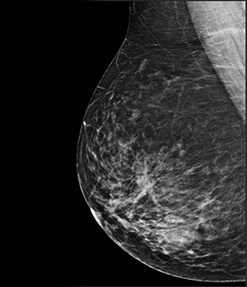 These include - heavily T2W DRIVE sequence & post contrast T1 3D fat suppressed imaging. The DRIVE images provide high contrast & improved resolution. 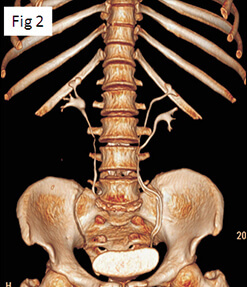 Nerves and vessels are seen as a dark structures / filling defects against bright CSF in basal cisterns. 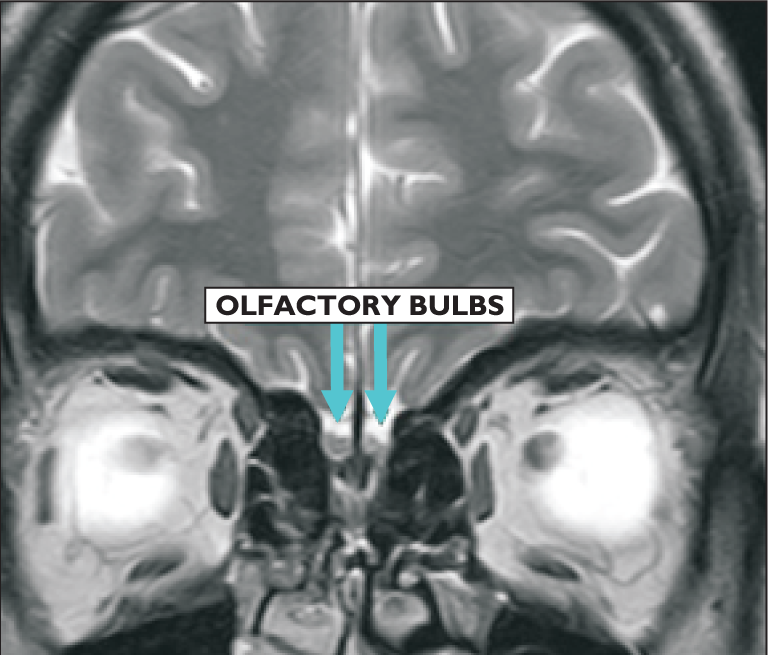 We begin this pictorial essay with normal appearance of cranial nerves followed by pathologies. The cranial nerves are surrounded by endoneurium, perineurium, and epineurium which maintain the blood-nerve barrier of cranial nerves. Various insults disrupt the blood-nerve barrier, allowing leakage and accumulation of contrast material with resultant perineural enhancement. Such disruption may arise secondary to neoplasm, autoimmune disease, inflammation, demyelination, ischemia,trauma,radiationandaxonaldegeneration,allresultingin abnormal cranial nerve enhancement. In addition we will discuss severalotherpathologiesaffectingthesenerveswithoutdisrupting thebloodbrainbarrier. CM refers to the disseminated seeding of the leptomeninges by malignant cells. 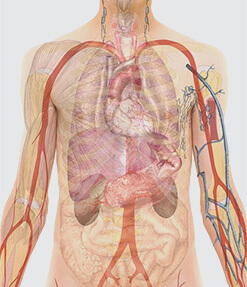 The most common cancers to involve the leptomeninges are breast (5%), lung (9-25%), melanoma (23%), lymphoma and leukemia. 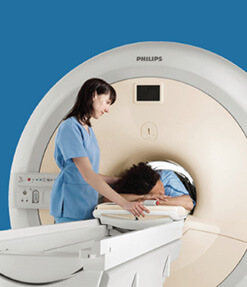 MRI findings include pial enhancement and nodularity, hydrocephalus, and coexisting brain or bone metastases. The presence of a single unexplained enhancing cranial nerve in a patient with cancer raises the possibility ofleptomeningeal dissemination. Known case ofBurkitt's lymphoma who had undergone imaging for evaluation ofintracranial disease. Involves the spread of primary mucosal or cutaneous tumors to noncontiguous regions along nerve sheaths. Retrograde spread is more common than antegrade spread. 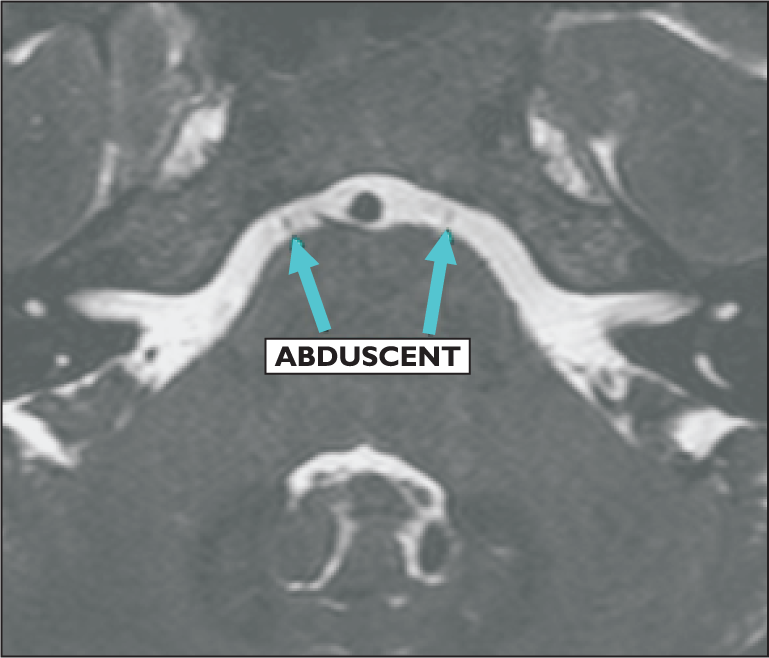 Perineural spread occurs most commonly with squamous cell carcinoma and adenoid cystic carcinoma, with the facial nerve and second and third divisions of the trigeminal nerve most frequently affected. 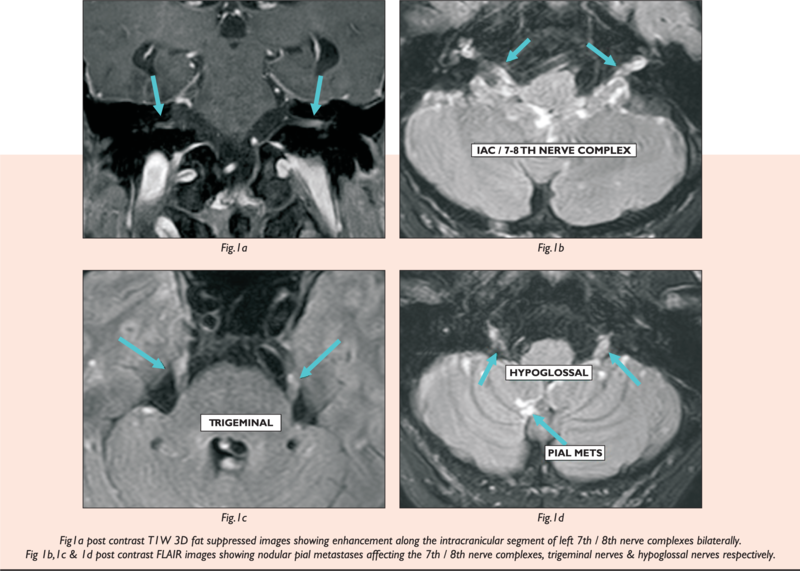 MRI findings of perineural involvement include smooth thickening and enhancement of the nerve, concentric expansion of the skull base foramina with obliteration of normal fatty contents, enlargement of the cavernous sinus, and neuropathic muscular atrophy. 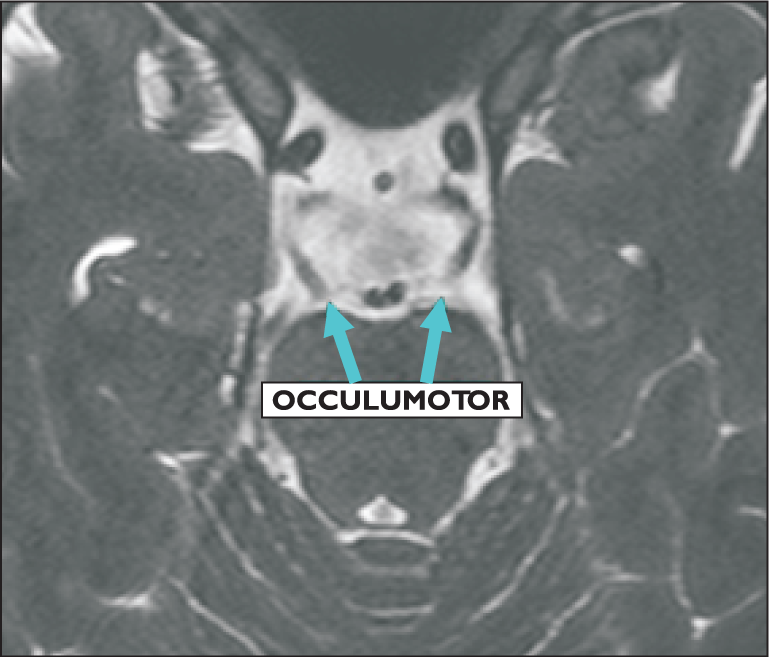 Elderly gentleman undergoing imaging for lower motor neuron left facial palsy. Past history of surgery for left parotid gland neoplasm . 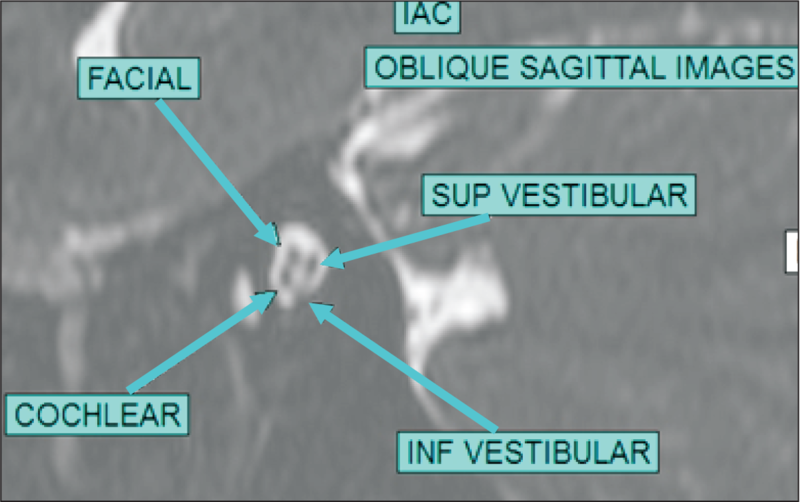 Vestibular schwannomas are the most common cranial nerve schwannomas, followed by trigeminal and facial schwannomas and then glossopharyngeal, vagus and spinal accessory nerve schwannomas. 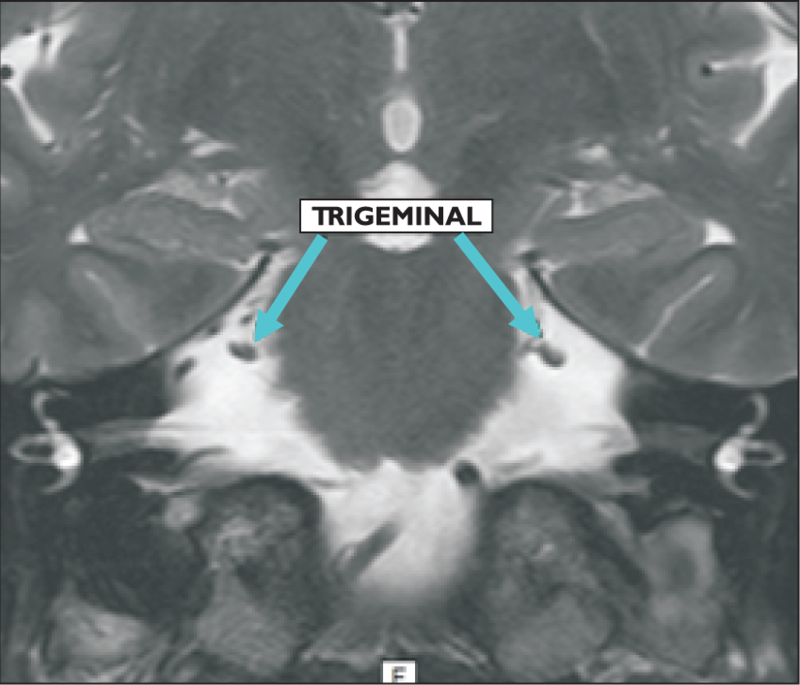 Young female presented with insidious onset right sided trigeminal neuralgia. 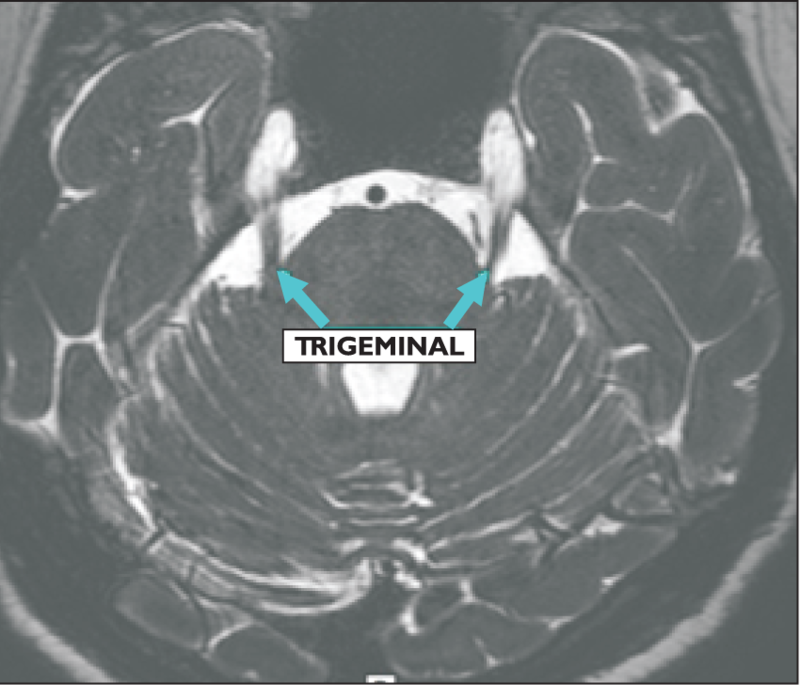 The axial image reveals smoothly enhancing right sided mandibular nerve at the foramen ovale.The coronal Images reveals enhancing right maxillary &vidian nerves in the foramen Rotandum &in the Vidian canal respectively. 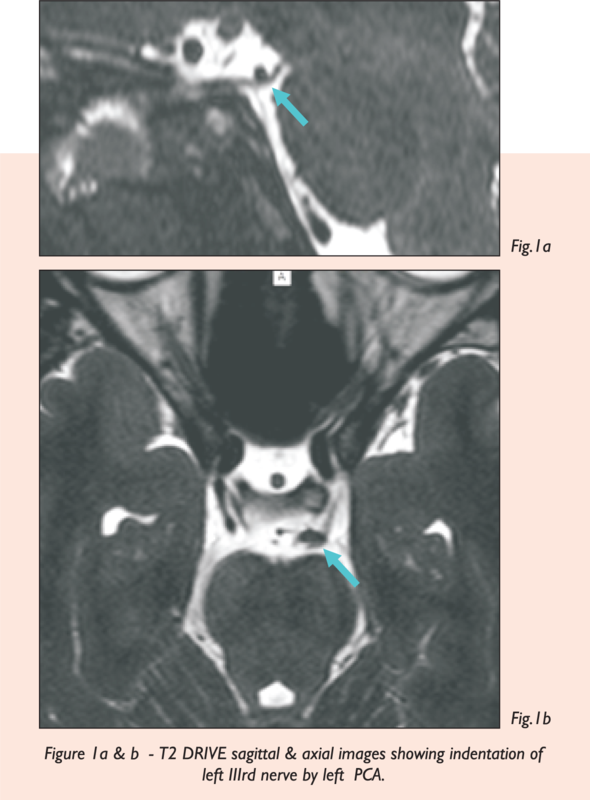 The image 2a shows smoothly enhancing right sided mandibular nerve at the foramen ovale.The image 2b shows enhancing right sided infraorbital nerve.Findings likely to be due to viral neurites. Bell's palsy is the most common cause of unilateral lower motor neuron facial palsy. In addition to normal enhancement of the facial nerve segments, there is pathologic enhancement of the intracanalicular-labyrinthineportion. 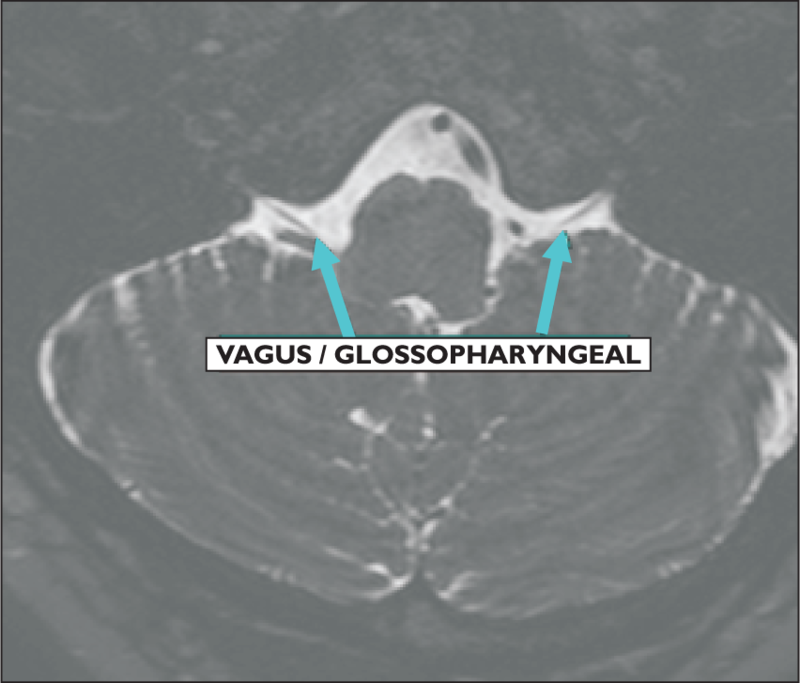 Normally the ganglion &descending portion of the facial nerve enhance.Enhancement along the cisternal, labyrinthine & extracranial mastoid segments of the facial nerve is abnormal. Young female presented with sudden onset right facial plasy. 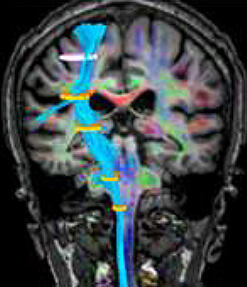 Young male with visuals symptoms. 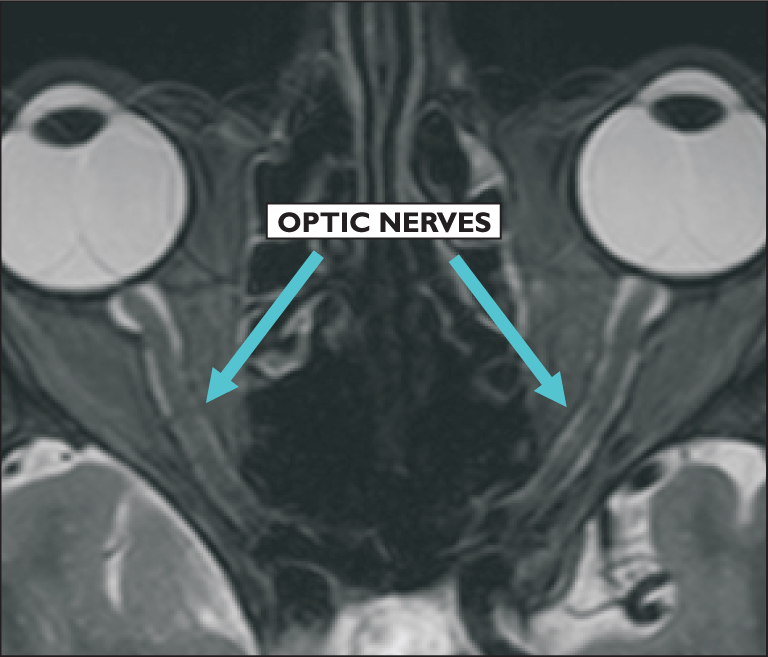 Multiple sclerosis can affect optic nerves with e/o demyelinating plaques along the course of nerve. Young male presented with multiple cranial neuropathies. Vascular loops or abnormalities like aneurysm, thrombosis,dissection can indent on cranial nerves and lead to neuritis. 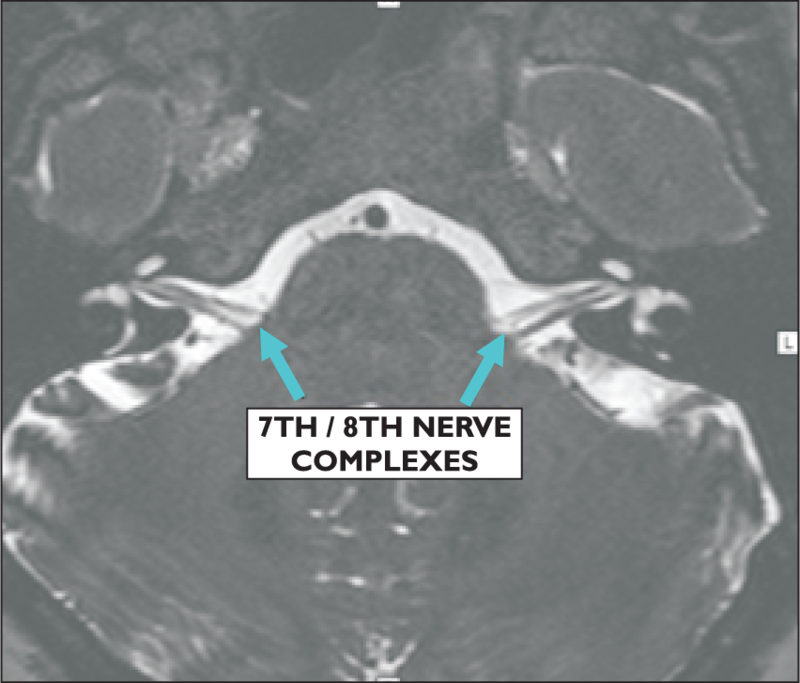 Most commonly affected nerve are the one with long intracisternal segment liketrigeminal,occulomor and vestibulocochlear and facial nerve complex. 60 yr old male presented with palatal and tongue weakness. 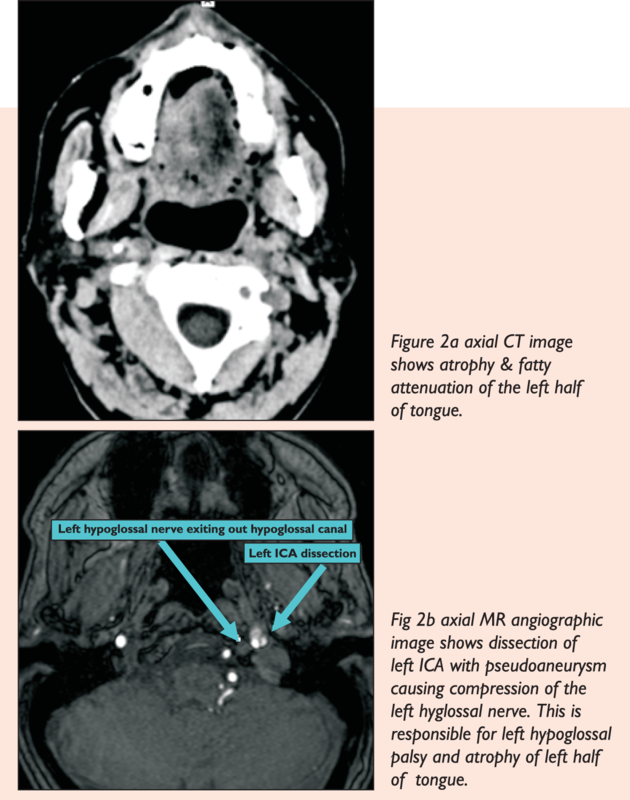 CT brain revealed atrophy of left half of t ongue.MR brain with angiograpghy was advised. 45 yr old male presented with right sided facial pain. In this news letter we have tried to give an over-view of cranial nerve pathologies, exhibiting some of the common and not so common pathologies. 3.0 Tesla MRI machines and newer sequences with high resolution imaging are now becoming standard of care for better evaluation and management of patients with symptoms pertaining to cranial nerves.